This famous surname is recorded in many spellings throughout Europe. Its origins are in fact Roman (Latin) and it describes a person who lived by or on a 'costa', normally a riverbank, but sometimes 'the coast'. The original translation from the pre Christian era of a 'costa' was the side (of a building), and by transference 'the side of a river'. 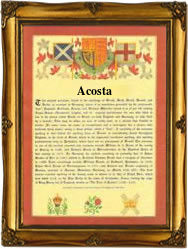 The spelling forms are found as the French Coste, Cote, Lacoste, Delacoste and Delcote, the Provencal Costa, and Costes, the Spanish and Portugese Acosta, Costa, and Cuesta, the Catalan Costa and Costas, the Italian Costa, Costi, and Da Costa, whilst the French diminutive spellings include Costel, Costeau, Cousteau, Cotteaux, Costiou, Coustet, Couston, Coustille, Costy, and the Spanish Costilla. Curiously the name when found in England as Cost, Coste, and Costa is not usually from this source at all, but from a nickname shortform of the Greek personal name 'Constantine', and as such 'imported' by the Crusders in the 12th century. Early examples of the surname recording from different countries include Thomas Coste who married Elizabeth Showner at All Hallows, London, England, in 1547, Sebastia Fortia Costa, who married Eluaria Matona at Bagur, San Pedro, Gerona, Spain, on March 10th 1613, Pierre de la Coste, who married Maria Dupuys, at La Rochelle, France, on April 13th 1614, and Mary Catherine Costa, christened at San Francisco, California, USA, on July 12th 1875. The coat of arms associated with the surnamew has the blazon of a blue field, a gold chevron pierced with a mans rib all gold, beneath two red roses. On a gold chief, a black imperial eagle displayed. The first recorded spelling of the family name is shown to be that of Miguel Martinez Costa, which was dated March 21st 1612, christened at Miranda de Arga, Navarra, Spain, during the reign of King Philip 111 of Spain, 1598 - 1621. Surnames became necessary when governments introduced personal taxation. In England this was known as Poll Tax. Throughout the centuries, surnames in every country have continued to "develop" often leading to astonishing variants of the original spelling.